It seems that even though many people continue to use charcoal and gas grills, the popularity of using an electric smoker is beginning to grow far and wide as more people come to realize just how easy and convenient they are to use. For many people, an electric smoker has everything they feel like they need for smoking their meat in an easy, cleaner, safer, effective way. 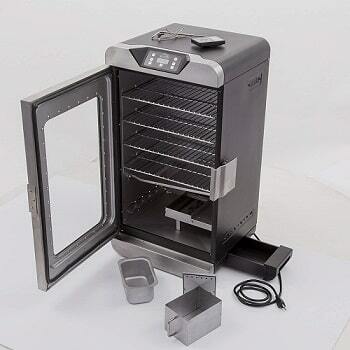 A top electric brand smoker currently on the market is the Char-Broil Deluxe Digital Electric Smoker. 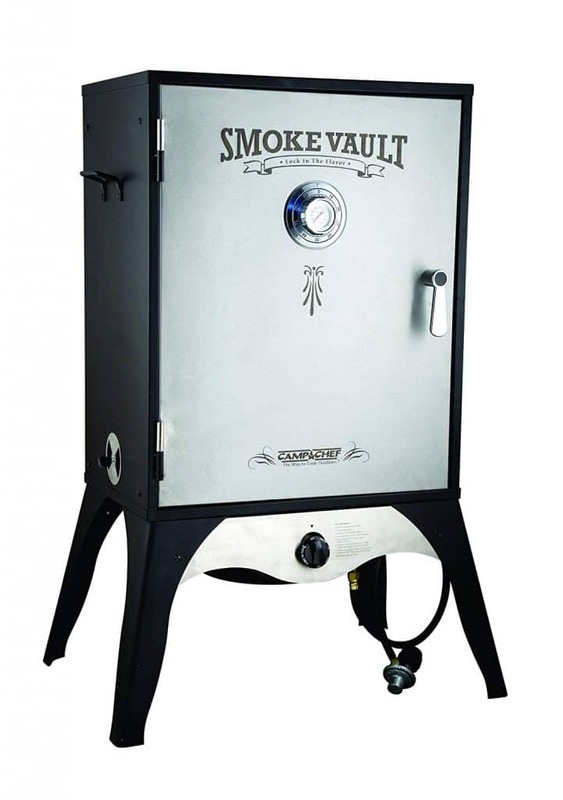 The smoker is uniquely built in a 725 square inch size. 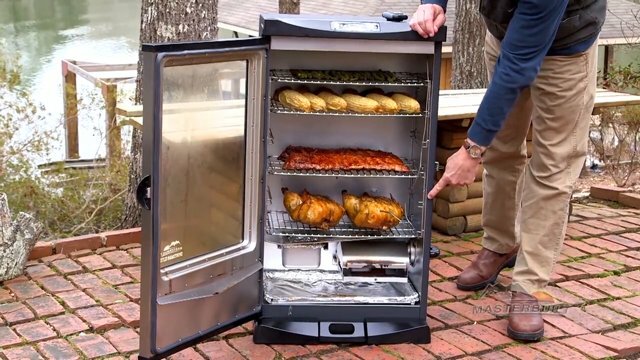 It seems to be the perfect smoker in the perfect size for those who enjoy entertaining many guests and cooking food for them. 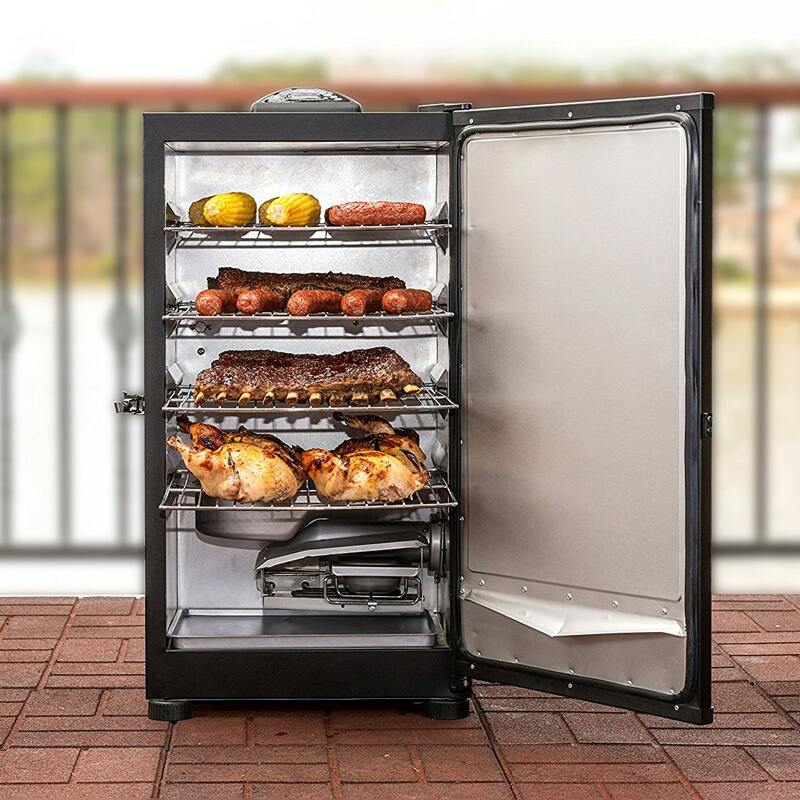 Yes, this electric deluxe smoker is meant for the larger groups, although you can still use it to prepare smaller smoked meals for yourself and your immediate family. With this electric smoker, you have easy access to the fire doors, air dampers, and the smoke racks which are all included in the 725 square feet of space. It’s very ideal for those extroverts who love to entertain. One of the top features of this smoker is the way the walls of the inside of it are double insulated for the best possible smoked flavor possible in your foods. 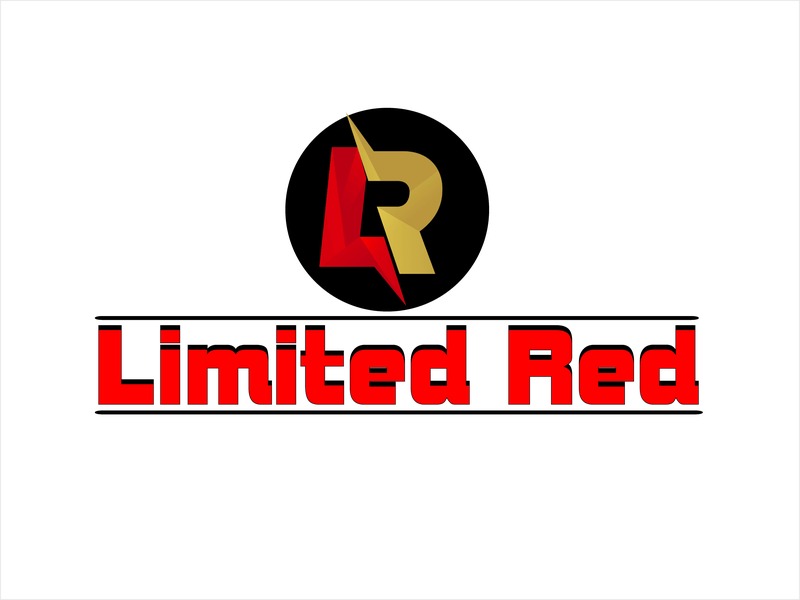 The hassle free design of this smoker is truly a unique feature of this particular smoker that you won’t find available in other similar electric smoker models. This hassle free smoker is 10 times more efficient in using its wood chips which means that you will need to refill the wood chip box 10 times less than what other electric smokers require from you. Get this, the smoke effectiveness will also remain the same throughout the smoking process. Now this feature is one that will be the most loved and appreciated by those that are especially new to cooking or smoking food. The error free feature for this particular smoker, means that there is an automatic shut-off mechanism for when your food is finished cooking. That’s right! The smoker turns off all on its own when the food is done cooking. We could most certainly use this feature in other cooking products as well! There is a feature on this smoker that allows the food to stay warm until it is ready to be eaten. So there is plenty of time to finish your outdoor game of horseshoes or game of cards before you start eating without worrying about your food getting cold. So you can easily get a good view of what is going on inside your electric smoker, there is a glass window on the front of it. This means you get to see the progress of your food cooking. There are many electric smokers that are solid like a refrigerator, and you don’t get to see inside of it so it is a plus when you have the glass window on front. The locking latch feature that has a tight seal, makes sure that the electric smoker is shut tightly so that no smoke escapes and the flavor can stay inside your foods without evaporating. This is definitely a plus when you are serious about your food quality and how well the flavors are marinated into your meats. Char-broil also has their own brand of wood chips that are recommended to be used with your electric grill to the get the best smoke taste possible in your meats. 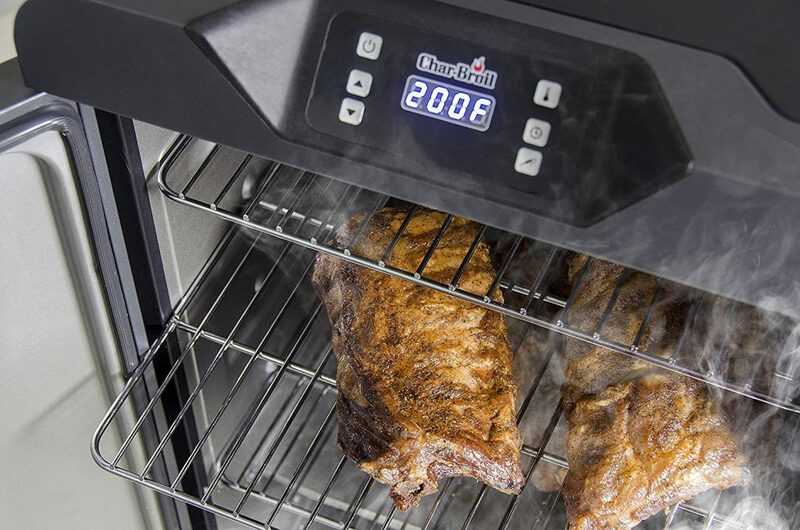 The Char-Broil Deluxe Digital Electric Smoker has a temperature gauge that is removable. Controlling the heat that you cook with is easy to monitor on the easy read advanced control panel with the blue LED display. The Char-Broil Deluxe Digital Electric Smoker is easy to move around from your backyard to a different location outdoors because it features a handle and wheels on the bottom of it.